The NFL is tight this season. As Neil Paine writes, the gap between the best teams and the worst teams is small, giving us more games that have come down to the wire. Week 6 is now upon us: The Eagles and Giants face off tonight at 8:20 p.m. Eastern time. 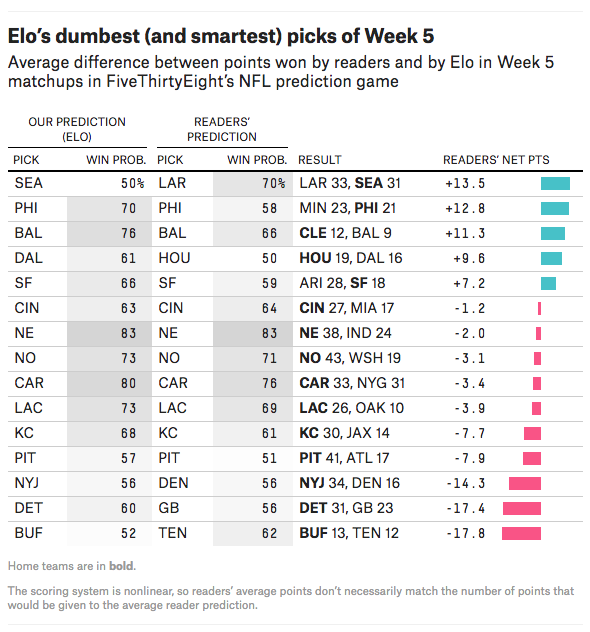 It’s time to take a break and submit your picks for FiveThirtyEight’s NFL forecasting game. 🙌 Paul Diaz is at the top of our Week 5 leaderboard, landing in first place with 183.2 points. 🏆 Jevon Mallett, with 438.5 total points, is first on our overall leaderboard. FiveThirtyEight’s Elo model is in 794th place with 122.5 points. 147 Columbus Avenue, New York, NY 10023.